Today, armed with piping bag in one hand and Jill Colonna’s Mad about Macarons in the other, I made my first ever Macaron at home – embarking on what is undoubtedly going to be the most frustrating culinary challenge I’ve ever set myself. As a self-declared baking noob, you are cordially invited over the rest of this year to share in my failures, tears and hopeful aspirations for success. 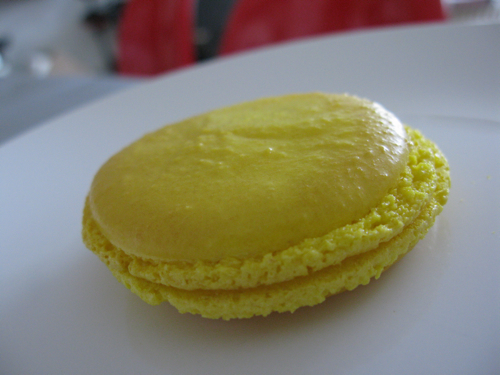 Here I present to thee, Project Macaron: my search for the perfect home-made Macaron. So how was my first time you ask? Appearance-wise, a little flatter and yellower (due to some food colour spillage) than I would have hoped for. Texture and taste-wise though, it far exceeded any of my non-existent expectations – crisp on the outside, but with that characteristic sweet chew in the middle. I must say, as time-consuming as the process is, there’s something incredibly addictive about watching the formation of these little meringue domes in the oven as they rise above their airy “feet”. Can’t wait to perfect the meringue shells and get on to making some fillings. Look out Pierre Herme and Laduree! Good for you!!! I have Jill’s book on my counter and the eggs in an airtight container in the fridge… Tomorrow is baking day for me. After your success I’m hopeful!! Kim: I hope it goes well! – do let me know how you fare. For a first run, I was particularly surprised to see that I managed to get the “feet” at the bottom. Just be careful with the food colouring if you are using any… you don’t want yours’ looking as lemoney yellow as mine! embarking on such endeavor takes a lot of courage, so congratulations! something_good: Tx for stopping by. Was just browsing some of your recipes and its inducing a post-dinner hunger pang! Your Rabo de Toro Oxtail stew looks right up my street and hope to give it a go one day… Will let you know how it goes! I love what you guys are usually up too. Such clever worrk and reporting!